Round-leaved sundews photographed by Julia Fisher (top left), Jennifer Walker (top right), Nancy Shackelford (bottom right, flower) and Kelly Fretwell (bottom left, budding). Round-leaved sundew is a small, carnivorous plant that grows no more than 25 cm (10 in) tall. It is easily recognizable from the long red 'tentacles' covered with drops of 'dew' that are actually a sticky liquid the plant produces. The leaves can vary from round to egg-shaped. 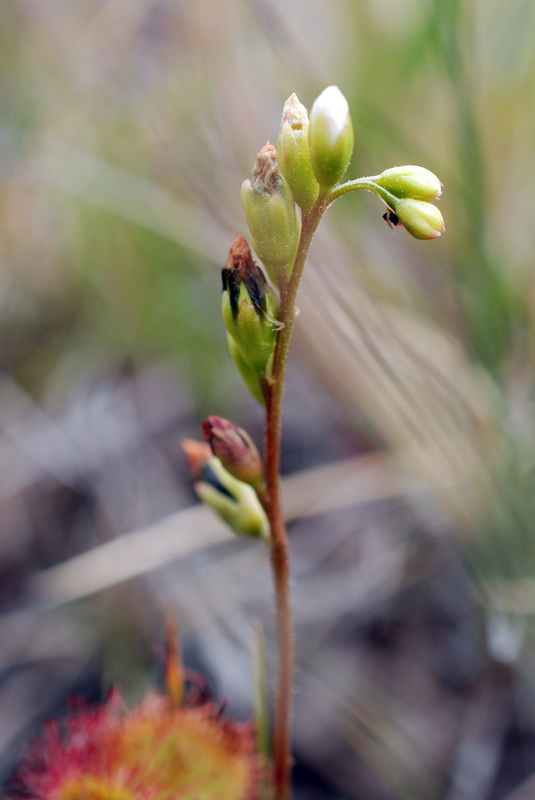 This species is found in wet, nutrient-poor sites like bogs, fens and wet meadows, from low to middle elevations. It is found throughout coastal and interior BC, and has a broad range extending across the Northern Hemisphere in much of North America, Europe, and Asia. Round-leaved sundew is very similar to great sundew (Drosera anglica), varying only in leaf shape. 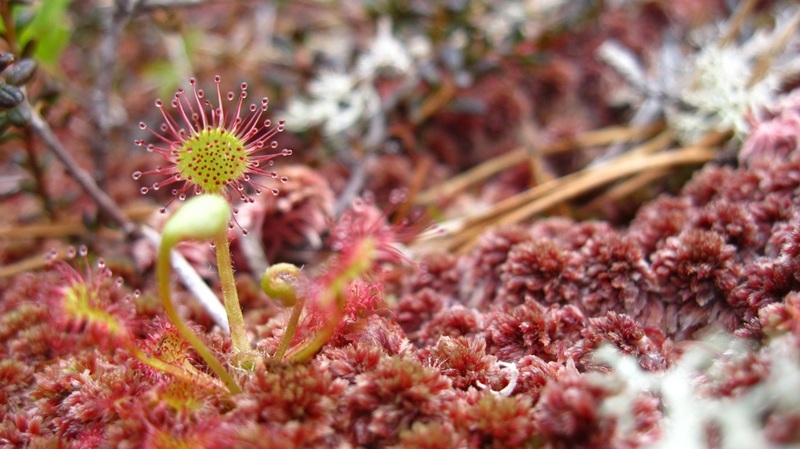 Great sundew has leaves that are generally at least 2 times longer than they are wide. Round-leaved sundew is much more common. 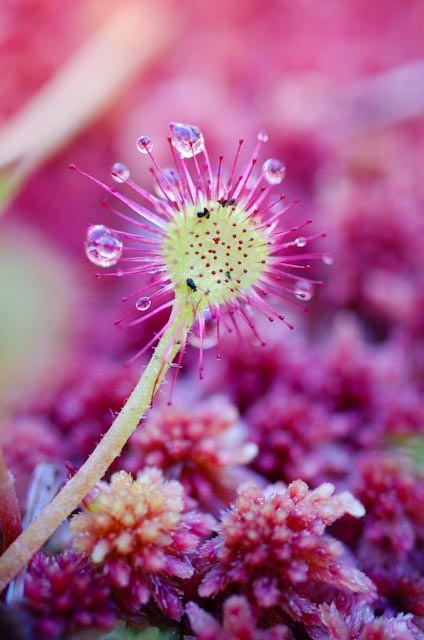 Humans across the globe, including First Nations of the Pacific Northwest, have used round-leaved sundew to treat skin maladies including warts, corns and bunions. The sap can be used to curdle milk, and leaves were used in Europe for making cheese and a milk dessert called a junket. The sap has antibiotic effects and has also been used to treat tuberculosis and other respiratory illnesses. The round-leaved sundew traps insects with its sticky tentacles, breaking them down with enzymes and using them for food. As they are often found in nitrogen-poor sites, these insects offer a supplement of this nutrient for the plant. 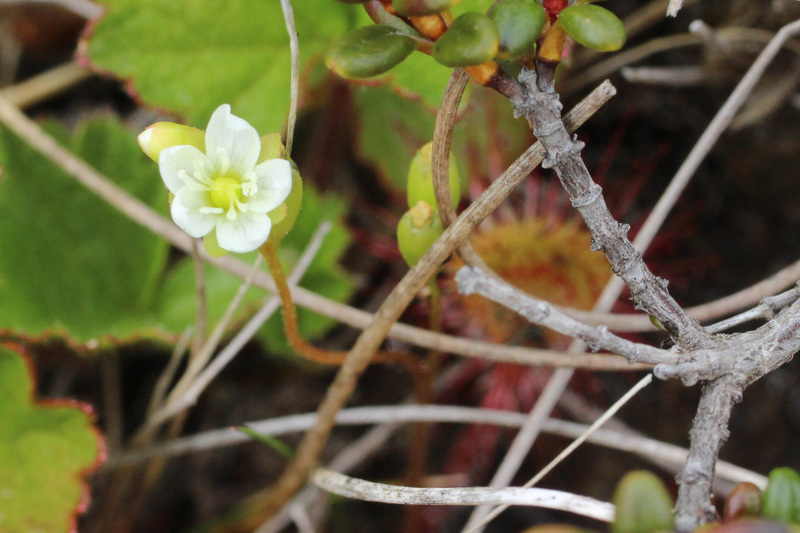 Other insectivorous plants in coastal BC include the great sundew and the common butterwort. A video of a round-leaved sundew capturing an ant can be viewed by clicking here. Drosera rotundifolia L. var. 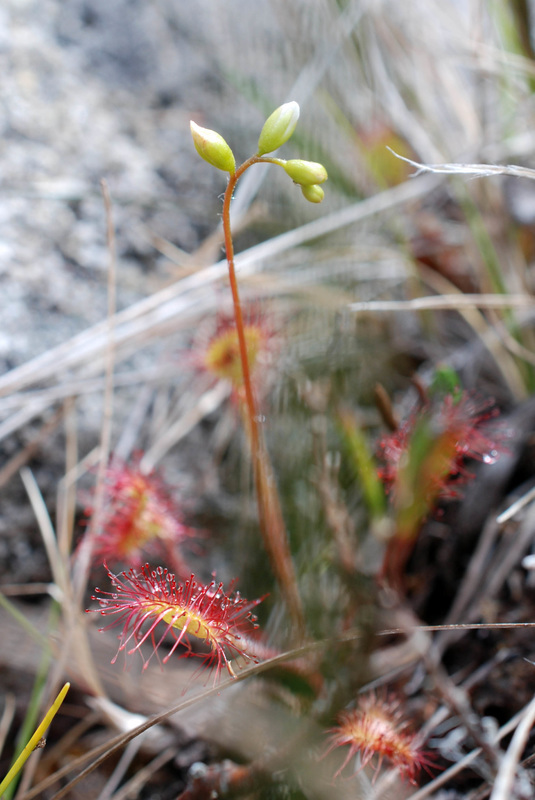 rotundifolia: roundleaf sundew; round-leaved sundew. In Klinkenberg, Brian. (Ed.). E-Flora BC: Electronic Atlas of the Plants of British Columbia [eflora.bc.ca]. Lab for Advanced Spatial Analysis, Department of Geography, University of British Columbia, Vancouver. Accessed on 01/26/13. Pojar, J. and MacKinnon, A. (2005). Plants of Coastal British Columbia, Revised. Vancouver, BC: Lone Pine Publishing. P. 351.